If you understand what you're doing, you're not learning anything. As I write this, Columbus, Ohio is in the middle of the lunar eclipse and it’s also a blue moon. There is a lot going on astrologically today, and I woke up at 4:44am feeling alert and awake. Three years ago on January 31, 2015 my beloved mentor and friend, Dr. Mark Chirila passed away unexpectedly after suffering a massive brainstem stroke a couple days after falling on the ice in front of his home. My life was so different then, and a huge part of my world shattered that day. The person I was then couldn’t imagine the person I am today. I felt lost and abandoned and was grasping at anything familiar to create a sense of safety and security. I felt I had found my purpose working with Dr. Mark, and though I was only there for a relatively short period of time, it had a huge impact on me as well as many people I care about and came to care about (his clients). Having that all go away in an instant was devastating. In many regards, I’m still recovering from that loss. This has been a Humpty Dumpty type of healing (or “reorganizational healing”). Everything fell apart in a way that it couldn’t be put back together the same way again. But three years later, I’ve made a stellar omelet of my life. I believe that Dr. Mark (and the larger force organizing him and everything else in the Universe) guided me along this path. I came upon Dr. Matthew Mancuso a couple years before I started care in his office. It was a curious thing that I didn’t start seeing him immediately, but I started seeing him mid-March 2017. And that’s when things really started to shift for me. He didn’t just help me to put the pieces back together same as they were before. He’s helped me to create a life that’s better than I could’ve possibly imagined. And it’s not just Dr. Matthew, but also the incredible staff at Intrinsic Care, including his wife, Carrie, and Dr. Lindsay Mack (who recently left to open her own office in Ft. Wayne, IN and be closer to her family). I wasn’t even a month into care when major aspects of my life changed dramatically. Many of the symptoms that initially brought me to the office are a fading memory. Things I just accepted as “that’s just how I am” and “that’s just part of getting older” are not part of my daily experience anymore. And instead, I have more health, vitality, energy… more LIFE. I started working at Intrinsic Care August 1st, 2017 after being in care there for about 4 months, and that has also been a huge metamorphosis. Every aspect of my life has improved. I’m so proud to be part of the phenomenal team there, which now includes Dr. Abbie Spencer, who is extremely passionate about the work we do there. We lift each other up every day. We laugh and cry and support each other. I wake up in the morning and I look forward to going to the office to see my team as well as the amazing souls we serve there. This is the team I always wanted to be a part of, though it’s honestly better than I could’ve imagined. So many aspects of my life ARE better than I could’ve conceived of them being. Our ideas of what’s possible come from what we know and have already experienced. And that’s why they’re so woefully inadequate. If my future self had told me about my life three years ago, I wouldn’t have believed her. Beyond that, I probably would’ve been deeply offended and upset by what she had to say, because it was so far beyond what I thought was possible for me, that it would’ve sounded almost cruel and taunting, though it would’ve come from a place of great love. The past couple years, I’ve somewhat consciously experienced a lot of energetic shifts. And a pattern has emerged. That pattern was very clear this week. Monday I felt great. Woke up ready to go, stayed in flow, got a ton of housework done and felt really pumped. Got my hair cut and ran some errands after that. When I got home, I felt kind of tired. I’d done a lot of stuff in the morning, but didn’t feel like I should be that tired. Got a solid 8 hours of sleep, but felt kind of tired in the morning still. Started reading The Mood Cure by Julia Ross (reading = listening to the audio book for me whenever an audio book exists) and it made a lot of sense to me. I had my first client coming for an Intuitive Guidance session with me. I was really excited, and all I wanted to do was clean my kitchen and the parts of the house she’d walk through on her way to the basement healing room. Her appointment was at 5:30pm and I had all day. But I didn’t do it. My kitchen was still a wreck with things gathered in piles everywhere and a couple sweet potatoes baking in the oven when she arrived 15 minutes early. I ran around making a few last minute preparations as I got her ready for the session and then settled into it. That went really well! And it turned out that (like me), she finds it kind of comforting when she goes to a person’s home and it’s lived in rather than pristine and perfect. Whew! After she left, I noticed the slight headache I’d had most of the day becoming more prominent. I also realized that the sweet potatoes were still baking in the oven. They turned into a delicious smelling, crusty, syrupy sort of mess. I turned the oven off and left them in there. Didn’t feel like eating much. I was also oddly nauseous. I’m not prone to nausea, generally, so it’s a noteworthy difference when it shows up. I’ve had plenty of flu and that kind of sickness throughout my life, so I know what that feels like. It wasn’t that. I didn’t throw up or anything. Just felt weird. Couldn’t think very well. Remembered that I had taken my Nuvigil (for narcolepsy) in the morning and my supplements. Hadn’t eaten great, but that was a pretty weird feeling. Wednesday I woke up feeling the same, but it was more intense. I used to call those kinds of headaches a psychic hangover, but I don’t feel that’s it. I think it’s a precursor rather than something that happens after the fact. Definitely in this case. I spent the whole day on the couch unable to do much more than watch some TV or tap around on my iPhone. The cat and parrot have been super agitated most of the week as well. Much whiny meowing and squawking. Always a treat. Neither one of them would sit with me to be petted. The bird just flitted between perches beyond my reach and screeched most of the day. I was really going downhill in the afternoon. A call from a friend brought up a lot of old wounds for me and I was depressed and extremely emotional the rest of the day. My husband, Shannon, had a lovely day till he came home. It was hard for him to deal with me in that state. Understandably so. I knew I wasn’t being reasonable or logical. But I also couldn’t get out of the hole. The message I got when I asked for help was that it would pass, but I needed to allow myself to go through it. I burned sage and smudged myself and the house to clear anything out that didn’t belong. Felt a little lift, but the heaviness was still there and got worse again. I’ve had one migraine in my life, and this is different. There are similarities, but it’s hard to explain. It’s a different feeling. And I can’t make it stop. It’s hard to just relax into it and let it run its course. Finally got to sleep late. I was thrilled to wake up the next morning (after some crazy dreams) feeling like myself again. Out from under the anvil of whatever that was. I was afraid to push it, lest it return. Wound up just having a very chill day in with Shannon after he returned from his morning job. He’s been doing a lot of handy man work this week and wanted some down time. We talked a lot. It was good. I went to the Clintonville Co-op shortly before they closed and got some things there that I haven’t been able to find anywhere else. Watched some TV and relaxed after making dinner. Then went to bed. Woke up this morning feeling AWESOME and energized! Last night I’d gotten chicory root granules at the Co-op to make like coffee (a tip from my friend Beatrice). The taste is somewhat similar, but instead of making your system more acidic like all coffee and many other things in our typical diet, it is an alkalizing, caffeine-free beverage that’s really good for you. Shannon woke up a little late, but I popped right up and made some of that and a decent breakfast. The chicory was good with some cinnamon! I got Shannon everything he needed to start his day, and everythin felt easy and light. I have some appointments today, and I have a feeling that there will be big shifts coming from somewhere. That’s the thing with this pattern I mentioned initially. This week is like pulling back a slingshot. Wednesday was where it was pulled back as far as it could go. It takes a lot of energy to hold that back. Thursday was having it held there and taking aim at the target. Still takes a lot of energy to hold it, but you’re focusing more on where you want the shot to go than pulling it back. And this morning was the release! Pechooooo! I don’t know what’s happening, but I feel myself hurtling through space right now. I don’t know what the targets are, or when I’ll hit them exactly, but that shot is in motion! It’s hard to remember this part when you’re in a Wednesday place, though. Really hard. Today I’ve got a lot of awesome work to do, and I’m excited about it! I don’t even know what yet, exactly, but I’m showing up. I’m going where I’m called to go and doing whatever feels right in each moment. And instead of thinking it would be good to write about this someday, I just sat down and wrote it, and now I’ll post it. I want to do more of that. There’s so much more to share! Much love to you! I was at an event a month ago hosted at my friend’s house. It’s a beautiful home set back in the woods with lots of windows and bird feeders drawing our feathered friends in close. The event was about creating a Native American Medicine Wheel Garden. During the first hours, we talked a lot about sacred space, empowerment and how we impact the Earth we inhabit. I was feeling really good and happy as we transitioned into a break. There was food and drink available, and I thought a cup of tea sounded nice. They have a lot of tea and several varieties were sitting out in a wooden chest; each in either a nice zip closure style bag, or in a tea tin. I picked one up and saw that it was called “Rainbow Harmony,” which really appealed to me. 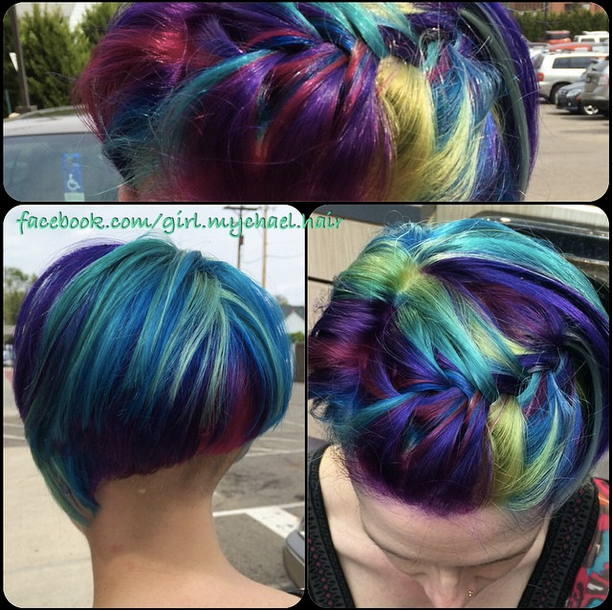 I was getting my hair dyed rainbow colors the next day, and it made me smile. After seeing that it had previously been opened (I typically won’t open a sealed bag), I grabbed the metal measuring scoop and shoved it into the little bag expecting to pull out a scoop of loose leaf tea. But it came out empty. I could see there was something in there, so I took a closer look and saw two dime-sized balls in the bag. “What kind of fancy tea is this? !” I thought. 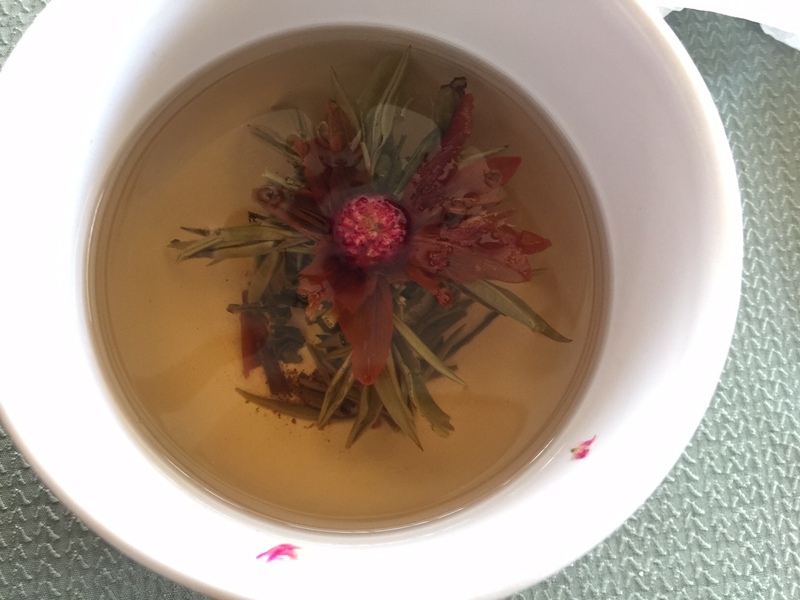 I read the label and it said it was a blooming tea, and to steep it until it unfurled into a flower. After popping one in a white mug and pouring boiling water on top, I took it over to a table where a few others were gathered. I watched as it unfurled and bloomed slowly. The aroma was delightful! The others at the table wanted to see, and so we all enjoyed its unfurling. And then I got to drink it. The flavor was subtle and earthy. The sweetness from the scent didn’t quite make it into the flavor, but it was a lovely experience all around and I savored every second of it. I even brewed a second mug of tea from the same bloom at the end of the event. And now I’ve written about it. So who was that tea for if it wasn’t for me? How many times a day do I think about something I want and then decide that somebody else deserves it more, or that it’s just not something for lil’ ol’ me. We all have different gifts in this life. Nobody sees things through quite the same lens as anybody else does. Why do I always feel like I’ll leave those things for somebody who would likely appreciate it more, or better? I dated a wonderful guy for nearly 9 months, and this post is about the end of that relationship and my feelings about it. I’ve had a lot of relationships in the past 20 years or so that I’ve dated. I have learned from all of them, and none are the same. The context of the relationships before I was married in 2000 was a lot different than the context of those that followed my divorce a short time after. I was never one for white-picket-fence-dreams of my own Prince Charming who would one day ride in on his white horse, marry me and make babies with me. I knew from an early age that I never wanted children of my own, and that is one of the few things in my life that has remained constant since. I didn’t dream about my wedding or being married. It was never a goal of mine. Long story less long, I dated a British guy for a couple years when the internet was still young, and we were still on dial-up. When it came time to end the cross-continental relationship, he decided to do so by selling his family business and moving to Ohio to take the distance out of our relationship equation. We married in January 2000 after using a K-1 Fiancé visa to get him over here. He went back home about 6 months later after not getting the right stamp in his passport on his way over to allow him to work in the US. It wasn’t a fun experience for him, and in hindsight it made all the sense in the world for him to head back home after that. I was really angry with him for the next couple years. I demonized him and felt very wronged. And then one day I realized that he had never done anything to hurt me. He was just living his life and doing the best he could from moment to moment. As we all are. If anything, the biggest mistake he made was moving over here in the first place. Him going back home was best for both of us. It just took me awhile to see that. I contacted him and apologized for the actions I took and words I spoke in anger. He accepted that and we are on good terms to this day, though we haven’t spoken in years. Fairly simplistic, but that’s it right off the top of my head. An object in motion stays in motion unless acted upon by an external force. In a relationship, the default mode is staying together. And many of us, myself included, tend to stay in relationships longer than they serve us. Breaking up is hard. Nobody likes it. Even if things have gotten really terrible and you’re relieved that it’s over, it’s still a hard thing to go through and takes time to process. But if you’re staying with somebody largely to avoid a breakup, you’re probably not happy there and you likely won’t be. I think my longest relationship lasted nearly 5 years (definitely not my marriage). And I stayed most of those years because I felt like real relationships took work. Lots of work. Relationships are hard sometimes. Stick it out, stay the course, make it work! Only… that’s pretty much all it was… was work. There was a lot more there in the way of shared space than there was shared experiences and joy. My most recent relationship ended yesterday. Not out of malice or spite, or just plain getting sick of each other. There was still a lot of good there. We’re both awesome people. He’s extremely intelligent, kind, compassionate, funny, multi-talented, helpful, and just an all-around good person as well as a really great friend. And I do miss him already. I’ve been thinking a lot about trial periods lately. I’ve been unemployed since November and getting by with help from my friends and family. During this time, I’ve tried lots of things with free trial periods. As soon as I start them, I carefully mark their expiration date in my calendar so I don’t incur any charges when I can’t afford it. When that date comes up, I cancel whatever it was, and make a few notes about what I thought of it so I can decide if it’s worth paying for later. There’s another side to it, though. The things I paid for after the trial period expired… Some of these are monthly services I could cancel at anytime if I’m not using it or stop liking it for some reason. I’ve had many experiences where I kept putting up with something long after I stopped liking it, or it stopped being useful, because I felt I passed the decision-making portion of that transaction already. I tried it, liked it enough to buy it, and that’s it. I didn’t have to think about it anymore after that. The evaluation period was over, so I tended to discount the input I received after that time. I’ve done this with many things and situations. Not just software and apps. I’ve done it with cars, jobs, houses, relationships… everything, really. There’s some perceived “point of no return” where I felt that once I passed that point, my opinions were somehow invalid. Actually, I don’t think I ever even get that far in the thought process. I think it’s more a matter of thinking about more pressing things, and just letting other things go; not wanting to give them my mental energy anymore. There are hundreds of lies we tell ourselves that keep us stuck in situations that no longer serve us. We are comforted by things that are familiar, secure and stable. We live in a society that rewards the latter two quite a bit. “Oh, that’s good. You stayed in the same job for seven years. That means you have a good work ethic.” In my case, that’s more like “Good job dying inside every day for more than five years while you were too scared to leave and thought that you couldn’t do any better.” I suppose that also describes a few of my relationships. Yikes. It’s not good, though. I’m not saying it’s bad to stay in a job or a relationship for a long time. I’m just saying that bad things can happen if we eliminate evaluation periods from our lives when we think we’re comfortable. For the most part, I think we do that out of fear. We’re afraid we won’t like what we see if we really look at it. “Don’t lift that rock, thar be creepy crawlies! I lifted it once and there were creepy crawlies, and I never want to see those again!” There is also “I’m fine. Everything’s fine. We’re fine. EVERYTHING IS FINE, OK? !” If that were true, taking a closer look wouldn’t be so scary. 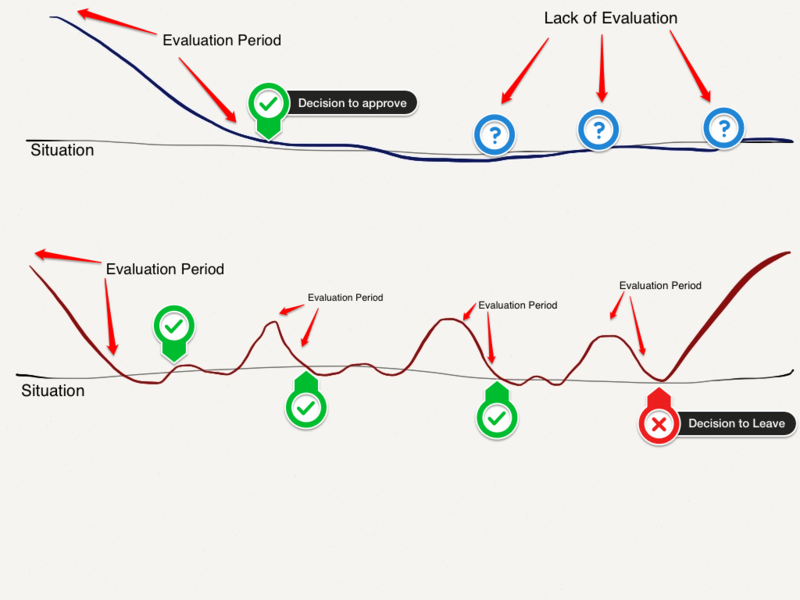 A lot of good can come out of evaluation periods, too. Especially in relationships. So many relationships fail when one person starts to feel like things are falling apart or going awry, but they don’t talk to the other person about it. They assume that they’re alone in their feelings. The level of communication decreases, rifts appear and widen to chasms. It’s usually at the point where that person feels things have become irreparably damaged that they finally let the other person know they can’t do it anymore. And quite often, the response they get is “You were feeling like that the whole time?! SO WAS I!” More frequent and honest evaluations and communication of the findings can go a long way to keep a relationship healthy. Jobs are easier to check. If you’re living for the weekend, and get a crippling sense of dread as Monday morning looms near, you could probably stand to make a change. I’ve referenced Switch before, and I’ve been listening to Drive on Audible. Both are great tools to help you get unstuck. I was walking with my friend, Andrew, the other day and he mentioned a Steven Wright quote: “Everywhere is walking distance if you have the time.” It got me thinking… Trial periods don’t ever really expire. Sure, there comes a point when the consequences for quitting change and make that less appealing, but most perceived points of no return are an illusion. And maybe you can’t go back to the way things were before you started. But you CAN go on to see what’s next. Even when that part is unclear. I’ve been living like that for over a year now, and I’ve never been happier. I’ve done some things that worked really well for me. Those things I’ve incorporated into my daily life as much as possible. I’ve done other things that didn’t work out so well, and I let those go relatively quickly. I note what I like and don’t like in situations, and move toward what I like. Sounds simple, but the results have been quite dramatic. In the past couple years, I’ve met and befriended some truly amazing people. That never would’ve happened had I not let go of the things and people that weren’t working in my life to create space for them. It’s that knowledge that propels me forward. If I’m holding onto something I don’t like, what am I preventing from coming into my life? Odds are that it’s something better. And that notion is good enough for me. So take a look around at your life. What situation would you cancel before the trial period expired? What would you gladly keep? The answers might surprise you. I know they’ve surprised me.